Ubisoft’s PC and 360 exclusive Splinter Cell title, Splinter Cell: Conviction, is one desired by many PlayStation 3 owners. The game has proven its worth to the market as the stealth game sneaks its way into the UK charts. 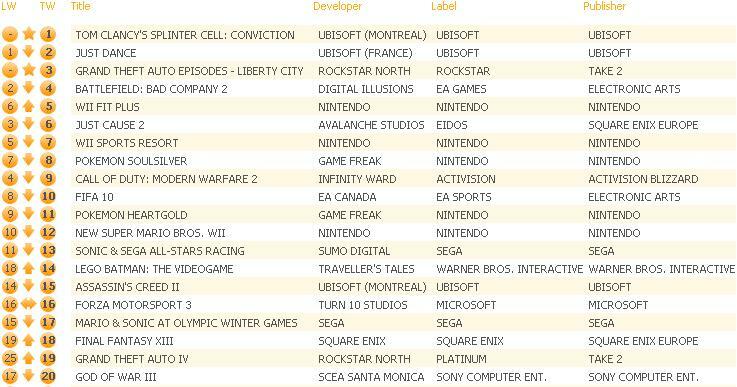 Splinter Cell: Conviction has taken top spot in the latest UK charts. The once Xbox 360 exclusive DLC, Grand Theft Auto: Episodes from Liberty City, has entered the charts at a respectable 3rd position. Battlefield: Bad Company 2 drops down to fourth while Just Cause 2 falls down to 6th. Last week’s charts can be viewed here.